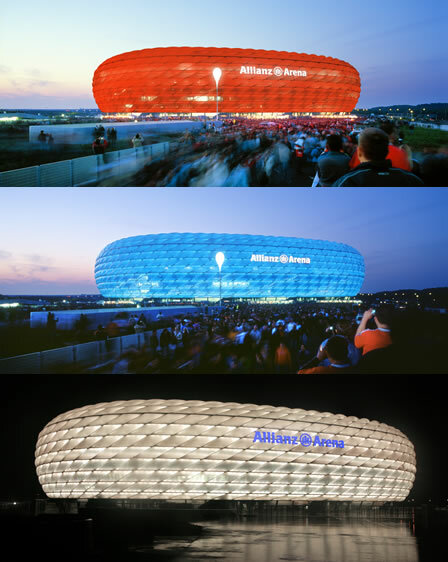 I was challenging the PARA II to model something like the Allianz Arena stadium in 3DS MAX. Each panel composed of a solid flat frame and a bulged part. To imitate the lighting effect I assigned a material modifier to the smooth part of panel and a Pattern controller change the index value. The skew effect of the skin is the result of the deform controller that takes the initial value from the sub-object controller and pass it to the UVW offsets in surface controller. The disadvantage of this method is when you try to use the UVW mapping to get uniform subdivision all over the surface. I shall add an option to surface controller to fix this problem soon.